This is only valid if you shut-off the engine after the finish line then tow the car back to the pits where you remove the plugs for reading! Or if you are on the dyno. VALID ONLY for full load acceleration or steady state dyno tests. Plugs are best viewed with a 10x power illuminated magnifying glass. 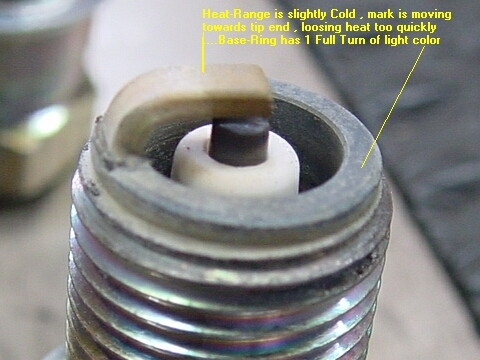 Heat Range = Ground Strap, the ground strap indicates the heat-range of the spark plug. If the "color" of the ground strap "changes" too close to the ground strap's end, (which is above the center electrode), then the heat-range is "too cold", meaning that the strap is loosing heat too quickly to the base ring, and is not able to burn off deposits until near its end. If the "color" of the strap changes near where it is welded/attached to the base ring (last thread ring), then it means that the plug heat-range is "too hot", because heat is not being transferred/cooled from the strap to the base ring quickly enough !!!! The strap might begin to act like a "glow-plug", eventually causing preignition and/or detonation later on. Proper heat-range is when the "color" is at the halfway point on the strap, neither too cold or too hot. 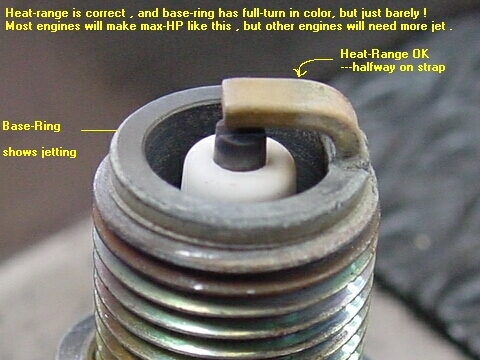 Jetting = the air/fuel mixture ratio shows up on the base ring (the last thread ring, it has the strap welded to it). You want a full turn of light soot color on the base ring!!! If you want to tune for max. 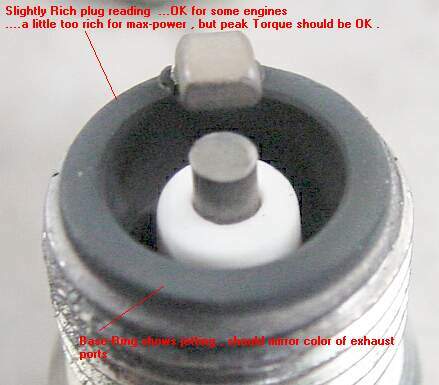 power, then you want 3/4 to 7/8ths of a full turn of light soot color to show up on the base ring, but this is on ragged-edge of being too lean, but will make the most HP on most engines. To be safe, leave it at a full turn of light soot color. If the base ring has a full turn of color, but there are "spots" of heavy buildup of "dry soot" on top of color, then jetting is too rich . If the base ring has a full turn of color with some spots of heavy dry soot, then jetting is too rich, REGARDLESS, if the porcelain is "BONE-WHITE", jetting is still TOO RICH !!! Do not look at the porcelain to read jetting !!! Porcelain = the porcelain shows up preignition/detonation, it will not accurately reveal jetting/air/fuel ratios. To look for the first/beginning signs of detonation, search the white porcelain for tiny black specks or shiny specks of aluminum that have fused to the porcelain. When detonation occurs, part of the air/fuel mixture explodes instead of burning, the explosion is heard as a "metallic knock", this audible knock is the result of a sound shock-wave, this shock wave travels back and forth across the clearance volume "disrupting" the cooler boundary layer gases that cover the entire clearance volume area. This disruption allows "more" heat to be transferred into parts, especially, domes/piston tops,...along with the very rapid rise in pressure like a hammer blow, pistons can get torched with melted sides and holes !!! With the early signs of detonation, the shock-wave will also rattle rings causing the tiny amounts of oil that now gets by rings, to be fused to the white porcelain as tiny black specks, also fused as specks are soot that was clinging to clearance volume surfaces in the relatively "still-air" of the boundary layer. One step beyond the black specks, will be tiny specks/balls of aluminum coming off the pistons that will be fused to white porcelain,....the next step to be reached is occasional pieces of the porcelain being broken-off as detonation gets worse, ETC. Soon after that are holes, blown head gaskets, broken connecting rods, ETC. Additional signs of beginning detonation are piston rings. By comparing ring's "free-diameter" to "out-of-box" free-diameters of new unused rings will reveals beginnings of detonation before much harm is caused !!! This is a result of the above previous explanation about heat being transferred more readily because the of the relatively insulating/cooler boundary layer being disrupted by the shock-wave. A piston ring is a simple spring, when a spring is overheated it will loose tension. Center Electrode = the very tiny sharply defined porcelain -"ditch" that encircles the center electrode, will also show up early signs of preignition/detonation and the wrong heat-range. Look for signs of the ditch beginning to be filled up with melted porcelain, you will need a 5x or 10x magnifying glass. Spark Plug Reading Discussion going on in our message board.